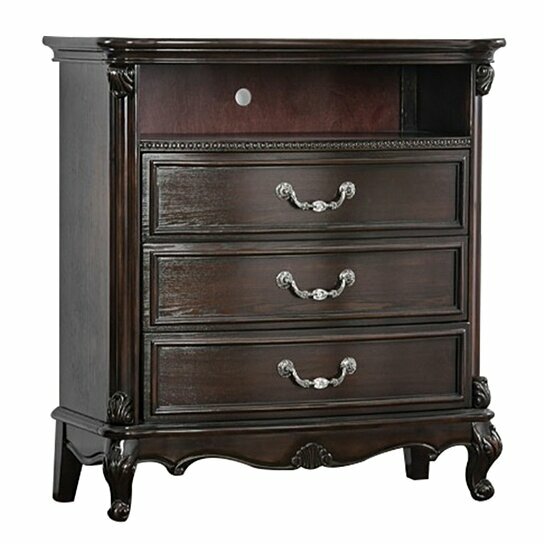 This traditional in style chest will transform the look of your bedroom settings. This media chest features three drawers with metal bail handles and one open shelf that provide an ideal space to store CD, DVD's player, remote and other media accessories. Supported by scrolled legs, this media chest is made up of wood and finished in dark brown that will blend perfectly with any decor style. Made up of sturdy solid wood and wood veneer that provide long usage. It features One open shelf and three drawers with metal bail handles. Perfect to use in your living room for the placement of T.V and media accessories.